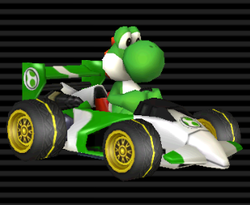 The Sprinter (known as the B Dasher Mk 2 in Japan, Europe, and Oceania) is a medium-sized kart that appears in Mario Kart Wii. Its appearance is based on a modern Formula One car and is the successor of the B Dasher from Mario Kart DS. The kart can be unlocked by unlocking 24 expert staff ghosts in Time Trials or by winning 3,000 WFC races. Its bike counterpart is the Sneakster. There is a kart in Mario Kart 8 called the Circuit Special, which greatly resembles the Sprinter. The Dutch version calls it Sprinter 2.0, making it a successor to this kart. The Sprinter features great speed; it is the fastest medium vehicle in the game. Its weight, which is tied with the Shooting Star, is also manageable, and it is the second heaviest medium kart in the game. Its drift is about average, but its other stats are rather low, and has the worst handling, off-road, and Mini-Turbo of the medium vehicles. The Sprinter's drift is tied with the Booster Seat. Its off-road ties with that of the Flame Runner. "The Sprinter is one of the fastest Karts available in the game. Fast? Yes. But can it cut a corner? Not so much. Things have a way of "evening out" in Mario Kart Wii. This Kart exemplifies the pros and cons of the stat bonuses." Diddy Kong, Bowser Jr., and the Male Mii are the only drivers not to use the color white for the body's color scheme. Diddy Kong's is orange. Bowser Jr.'s is dark green, and the Male Mii's is black. Additionally, the Female Mii is the only driver to use creamy white (a shade of the color white) for the body's color scheme while the rest use the standard white. Daisy's Sprinter can surpass the Spear's default speed by one point. If Funky Kong rides the Flame Runner, its speed will be equivalent to the Sprinter's default speed. This page was last edited on March 5, 2018, at 19:15.